i Still Love Dogs > Grrr > Would You Buy Food from a Company Whose CEO Abused a Puppy? FEB. 23, 2015 UPDATE: Des Hague pleaded guilty today to one count of animal cruelty. If you purchase a hot dog at the brand-new Levi’s Stadium after it opens next month in San Francisco — or buy food at hundreds of other venues — you’ll be putting money in the pocket of Centerplate catering company’s CEO Des Hague, who was caught on surveillance camera late last month kicking a Doberman puppy in an elevator. Hague can be seen repeatedly kicking the puppy’s stomach and then choking her — he yanks up her leash so she’s suspended in the air. 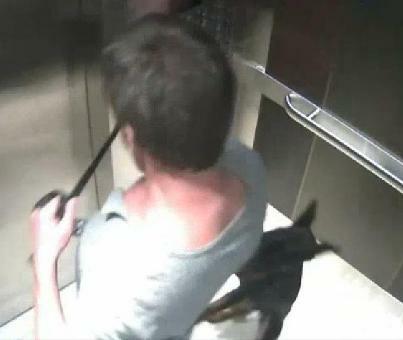 The video was taken July 27 at the upscale Private Residences at Hotel Georgia in Vancouver. When BC SPCA investigators tracked down Hague in one of the condos, they found the puppy, named Sade, in a urine-soaked crate, with food and water bowls beyond her reach. When Sade was removed from the crate, she was skittish and appeared to have been physically abused. “The dog was removed from the owner,” Mary Moriarty, BC SPCA chief prevention and enforcement officer, told Global News. But Hague, a friend of the puppy’s owner, is not yet facing any animal cruelty charges, although they have been recommended by the BC SPCA. Hague also remains the CEO of Centerplate. So far, no venues — including Denver’s Mile High Stadium, San Diego’s Qualcomm Stadium and the Los Angeles Zoo — have cancelled their Centerplate contracts. In the meantime, stadium guests have started boycotting Centerplate. At BC Palace in Vancouver Sunday, Canadian Football League fans told the media they would not be purchasing any food, and that Hague should be fired immediately. Hague conveniently deleted his Twitter account, but animal lovers are using the hashtag #DesHague to condemn the puppy-kicking CEO. You can contact Centerplate via email at info@centerplate.com. If you’re still planning to buy food from a venue that uses Centerplate (here are all their North American partners), I highly recommend that you watch this surveillance video first.